Try this trick to get big retweets. How would you like to get more retweets on Twitter? Retweets are something most of us would like to get. They usually mean more exposure, followers and maybe even more traffic to our websites. 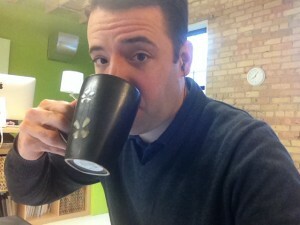 The last few months I’ve been trying something new at GBW with my personal Twitter account. I figured that one way to get more exposure for my Twitter profile was to get others to retweet my content. I started by trying it with individuals that had pretty good followings. That worked out pretty well, but then I wanted to go bigger. I wanted to get big brands to retweet my content. And the results have been really strong. If you want big brands to retweet your content, I think you can do it with this same strategy. Target audience is everything on social media. You can get a brand like NASCAR to retweet your content, but if your target audience isn’t NASCAR fans then you’re wasting your time. You have to target the people that can potentially give you money. I’ve had pretty good success with targeting the right brands. I haven’t hit it right every time, but the good thing with big brands is that they have a lot of customers and followers. There is a good chance that at least some of your target audience members follow them. The best way to get people, including big brands, to retweet your content is to write blog content about them. That’s been the strategy at GBW and it’s been working. We always try to write content that is first interesting to our target readers. If your content isn’t interesting and useful you’re going to struggle so the content has to be good for your readers. But there are posts you can write that are interesting to readers and that include big brands. 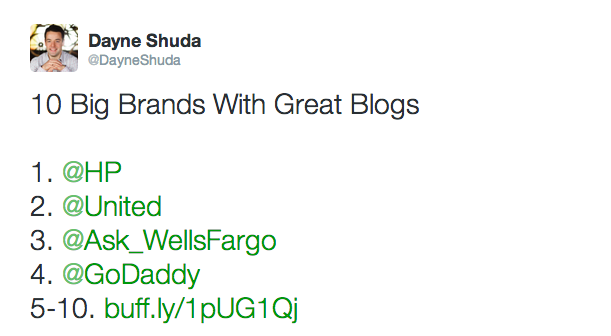 Here is a post we did – 10 Big Brands With Great Blogs. At GBW, our potential clients are businesses of all sizes. One thing they’re looking for is social proof. They want to see that other businesses are blogging. That gives them proof to try blogging for themselves. So when we show that 10 big brands are blogging we give them that proof. They can read about those brands and those blogs and become interest and convinced about blogging. And in the process we’re also writing about big brands and they love that. You can see that it includes mentions of a couple brands included in the tweet. It also entices my followers to want to click through and see the other six brands. I mean, once you’ve read four of them you have to find out the others. The key with this step, though, is that big brands are following their Twitter accounts. They will see that you’ve mentioned them, written about them and they’ll sometimes retweet your tweet. Let’s step back for a moment – the key to this strategy is to first get over the idea that big brands won’t interact with you. That’s ridiculous. They may be big brands, but behind the logos are people just like you and me working on the social media campaigns. They get excited about mentions like this. It can actually make them look really good and it makes sense for them to share the content with their followers. With this kind of retweet, brands can kind of say, “Hey, look at how good we are!” without really boasting. Identify brands with the same target audience as you. Mention them when you share the content. That’s it. Three steps and you’ll be getting more retweets, traffic and followers on Twitter. Well, there is one other step you’ll want to include. When big brands give you a retweet, give them a mention saying thanks. It’s a nice little gesture.